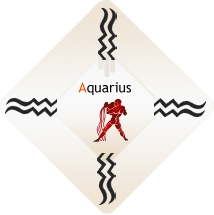 Perhaps the most misunderstood sign of the zodiac, we can for sure say that the Aquarius personality values intelligence, ideas and loves a good theory. Yet progress for its own sake is not what you’re after; Aquarius people are the discriminating embracers of innovation that works. Just to give one not so random example, you’ve probably got your hand on a mouse right now. That was invented by Douglas Engelbart, an Aquarian.